Remember the satanic panic of the 1980's? Society thought every emo kid and every hippie who liked to take hikes alone in the woods were worshipping Satan. They were so far off. The culture would be shocked if they knew how organized the Satanism religion is. Like regular churches, they have pancake breakfasts, church secretaries that still somehow rock perms, and a yearly silent auction fundraiser. Sure, there are plenty of differences. Those Pancake breakfasts take place at four in the morning after a night of twisted latin and dark ritual. The big-haired secretary spends much of her time ordering black candles and goat's blood. And the baskets put together by the parishioners are much more interesting, filled with taxidermied bats, skull-adorned decor, and enigmatic potions. And while the satanic priests are great and all, you're sure to get the first pick of these amazing baskets of darkly-curated goods with this Evil Bishop costume. This bishop's robe is a twisted version of a Catholic bishop's ensemble. A dark red velour background is accented with a silver-trimmed upside-down cross. The yoke is soft, made of black knit fabric. It has a pointed hem and wide ceremonial sleeves. The ensemble is topped off with a pointed red hat and a double-crossed symbol to make you ready for a dramatic entrance. 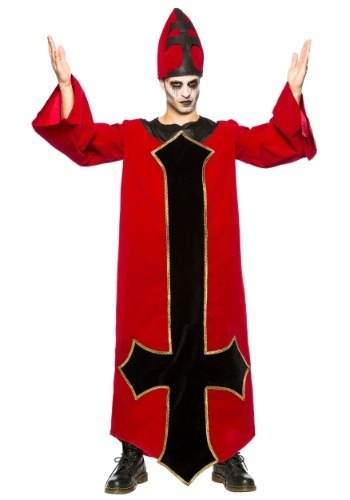 Become the leader of a shadowy church with this dignified costume. You'll love breaking this out for a smokey haunted house or offering people blasphemous blessings at costume parties. A look this dramatic is always sure to make an entrance so you can be sure you get the respect that you deserve. Just remember to let your parishioners know about that pancake breakfast at four o'clock on Sunday morning. Even satanic churches need those sweet, sweet donations.